What is a cooling tower? A cooling tower is a heat negating device that expels the additional heat into the atmosphere through the water stream cooling process. This is either done by evaporating a certain quantity of water in order to eliminate process heat or it is done with the help of air cooling process. This, in turn, lowers the temperature of circulating water used in oil refineries, chemical plants, thermal power stations or HVAC systems, thus providing cooling effects to the industrial buildings. Now you must be clear about what a cooling tower is but do you know what cooling tower parts, make up a total cooling system? Read on to find out. What makes up a cooling Tower? Each and every component of a cooling tower is designed for a specific function that all together works to offer effective cooling. This is one of the most essential parts of a cooling tower. These are plastic films that offer an extended surface area for facilitating fast water evaporation process. Heated water is made to spread through the fill media, so that it gets vaporized at a much faster pace. Fills media is generally made from PVC, wood or even polypropylene. There are mainly two types of fill media, namely splash fills and film type fills. The industrial cooling tower manufacturers offer both the types of fill media, that are perform effectively to offer the services intended. These are elements that help remove water particles from the discharged air. This is done by diverting the direction of the water laden air so that it water and air get separated. These are normally made from PVC. The water cooling towers manufacturers build high performing drift eliminators that help diminish the loss of process water. These are parts that help force air throughout the cooling towers. The cooling tower suppliers offer a variety of fans that produce negligible noise and are durable enough to withstand the acerbic atmosphere they are installed in. Fans are generally made from aluminum, glass fiber or fiber reinforced plastic or FRP. One should note that FRP fans are more common due to its lightweight and ability to consume less power. These are components that are specifically used in crossflow type of cooling towers as these towers make use of gravity flow distribution. With the help of nozzles, water is lifted up to levels above the fill media first and then is raised down to the fills, with the help of gravity. Nozzles are generally made from plastic but can also be made from PVC, glass filled nylon or even ABS. The modern type of nozzles includes non-clogging types of nozzles that are designed to perform exceptionally well. 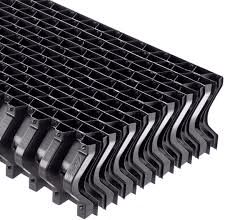 These are cooling tower parts that avert sun rays from entering the cooling towers and also prevent water from overflowing out of the tower. This not only helps maintain water coolness but also helps prevent the formation of mold or algae inside the tower. Air Inlet Louvers are generally made from asbestos sheets. It should be a noted fact that these louvers become scaly over a period of time. Effective cooling tower services provide the required aid in such cases by offering maintenance and cleaning at its best. Looking at the above cooling tower parts and their respective functions, it would clear by now that how every part is essential for proper function of a cooling tower. So whenever looking for cooling towers for fulfilling your industrial needs, it is better to explore the best cooling tower companies in India that not only offer effective cooling tower installation but also provide servicing and maintenance services.